The Media Education Foundation, who distributes TV FAMILY to the education market, has been soliciting reviews of the DVD (which they sell/stream here). I'm very happy about the praise it has been getting. "A marvelous slice of television history. Ethan Thompson has brilliantly examined the making of a fascinating, forgotten 1960 NBC documentary on family life. Thompson's insightful interviews with family members and media experts peel back layers of meaning, exploring tensions of the era surrounding documentary production, representation and American ideology. Will be required viewing for everyone interested in the history of television, gender studies and American Culture." "This is a fascinating exploration of a long-overlooked program that forecasts our current reality TV craze while harking back to the old March of Time factual recreations. The Robertson family of Amarillo, Texas were the Loud family of their day. This heartfelt and moving documentary cuts between past and present to give us a glimpse not only of what one 1960 American family was like, but what early television was like, and how its version of American family life contrasted in striking ways with the reality." “Informative and engaging. 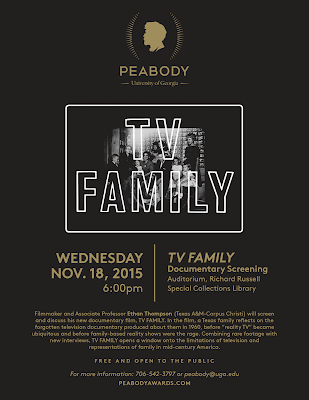 TV Family presents a really insightful blend of archival material of Story of a Family, first person reflections by the family members who were involved in the show, and critical analysis, by media scholars but also by some of the family members who offer very thoughtful and reflective analyses. It provides audiences with an important piece of TV history, one from which my own students, who think reality TV is a recent phenomenon, will benefit. The documentary successfully provides a social, cultural and historical context for the original show, locating it not just in TV history but also as a product of its own specific cultural moment." I just got the new catalog in my office mailbox from the Media Education Foundation. It includes TV Family! I'm excited that TV Family is now available in a 56-minute educational version for classroom use. It is being distributed by the Media Education Foundation. I'm continuing to work on home distribution, and expect to be able to announce TV distribution soon. "Fascinating. If you're an educator looking at the rise of unscripted programming, representations of the family in mass media, or how myths of the American Dream have always been caught up with dominant ideas about gender, class, and race, this is the film for you and your classes!" "Emotionally moving and insightful, this film exposes television's ideological whitewashing of representations of family and domestic life." 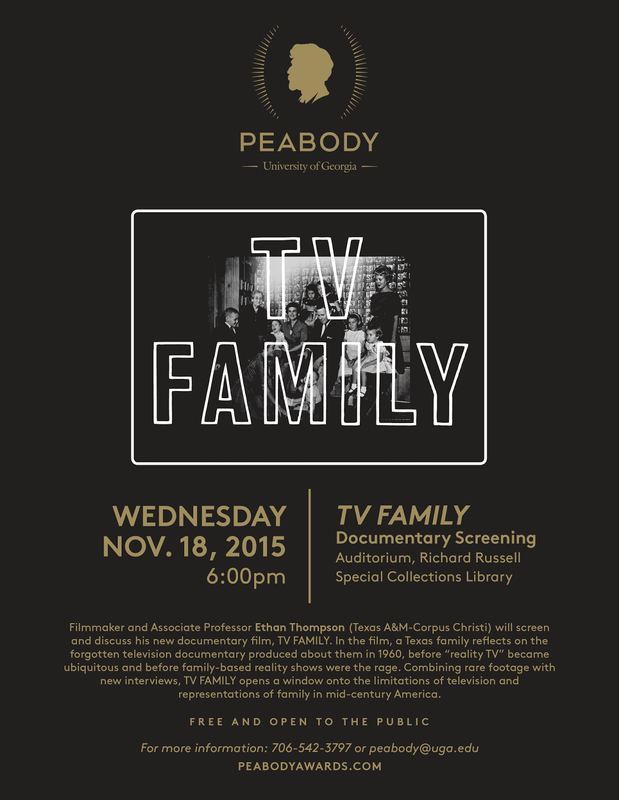 TV Family Trailer: August 18, 2015 from Ethan Thompson on Vimeo. I'm really excited to share a sneak peak at two of the animated sequences in TV Family. These sequences introduce the different thematic segments of the documentary, and there are five of them. They were made by Phillip Niemeyer at Northern-Southern, who (lucky for me) is also a big fan of the graphic design work and art done in the 50s and 60s by William Golden and Ben Shahn. Original music in both is by Carlos Cooper. The first is "The Family Sought," which investigates how NBC selected the Robertsons as the subject of Story of a Family, and how the program fit in postwar discourse on the family and TV. The second is "The Real Story," in which the Robertsons discuss how the special distorted and omitted aspects of their lives.